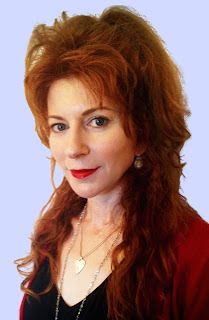 Today I am very excited to welcome to the Blog, Alison Goodman, Author of the Dark Days Club. I first saw Alison reading from this way back at a blogger Brunch last year, and one of the things you got from her talking about the book was the level of research and passion that Alison has for the era. She does extensive research to immerse herself in the world of her books, and with this comes a lot of different experiences that affect the different senses. What is becoming one of my favourite features to do with artists, is to get them to discuss either their books or their writing journeys through the sense, so I asked Alison to take us on a sensory journey of the Dark Days Club. 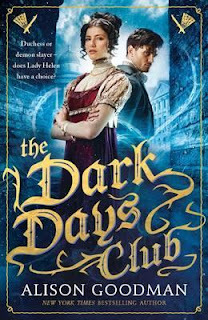 The idea for The Dark Days Club came from my love of Jane Austen and Georgette Heyer and my equal infatuation with modern heroines like Buffy and Jessica Jones. I realized I wanted to read a combination of the two: a thrilling supernatural adventure in Regency England with a strong heroine and just a dash of dashing romance. I also decided I wanted my 1812 London to be historically accurate so that my readers could immerse themselves in all things Regency. I wanted them to be able to walk alongside Lady Helen—the main character--as she discovers that her upper class, luxurious world has a hidden demonic underside. 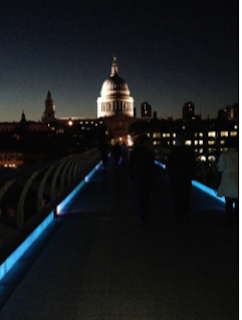 This is a photo I took of St. Paul’s Cathedral from the Millennium Bridge in London while I was there to research The Dark Days Club. Obviously, the Millennium bridge had not been built in Regency times, but by then St. Paul’s had been standing for just over a hundred years. For me, the photo sums up an interesting notion that grew out of my research: there is an uncanny parallel between the Regency era and today. The Regency was a time of excessive consumption, an ever-widening gap between rich and poor, hardship caused by climate upheavals and a drawn out war. Sounds familiar, hey? In The Dark Days Club, Lady Helen has to run and kick and fight demons, all in a long gown and boned stays. 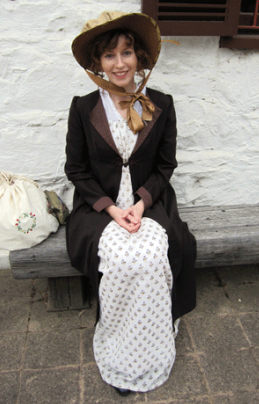 I decided I needed to know what it was like to wear historically accurate clothes, so I hired a seamstress to make me the Regency ensemble that I am wearing in the photo: chemise, boned stays, petticoat, gown, and pelisse (the long jacket). I am proud to say, however, that I made the bonnet myself. Apart from the enormous fun of dressing up (I use the clothes for PR and a bit of re-enacting from time to time), I also discovered that the classic diamond construction of the shoulders in both gown and pelisse made it very hard to lift my arms above my head; valuable information for a fight scene. 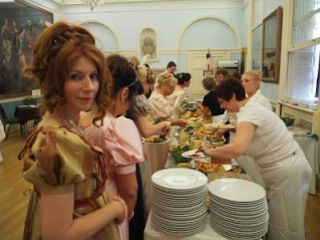 Silky poached salmon, sharp stilton cheese, creamy egg pie–for me, these are the tastes of a Regency Ball. In the photo I am at the Jane Austen Summer Ball in Bath lining up for supper, and you can see the anticipation in my face. I was ravenous. During the Regency, a ball would go from about 9pm until 3 or 4am the next morning—six hours of dancing. A full supper was usually served around midnight in the a la’ francaise manner: up to fifteen sweet and savoury dishes were all served on the table at the same time including hot meats, sweet jellies, hot and cold vegetables, meat pies, fruit tarts and junkets. These would then be “removed” to make room for the next fifteen sweet and savoury dishes. Finally, a table full of desserts would end the meal. Phew! Now, it is a truth universally acknowledged that a Regency novel must always be in need of a dance scene! Jane Austen built Pride and Prejudice around three dances: the Meryton assembly ball where Lizzie and Darcy first meet, the more informal dance at Sir William Lucas’s, and the Netherfield Ball. Dancing was a crucial part of genteel Regency life. As part of my research for The Dark Days Club, I learned how to dance in the Regency manner. I loved it so much that I now dance whenever I can: at classes, festivals and balls, and sometimes I even teach other people how to set and chassé. This video is of a contra-dance (country dance) called Sir Roger de Coverley being danced at a Jane Austen ball in 2012 (alas, not the one that I attended). The music is very typical of the period and is definitely one of the sounds I associate with the Regency. 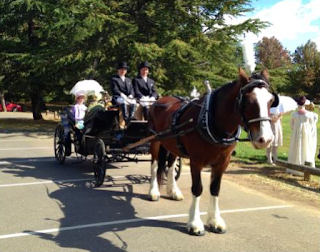 You can’t actually see me, but I am in that barouche carriage tucked behind the drivers in full Regency dress. 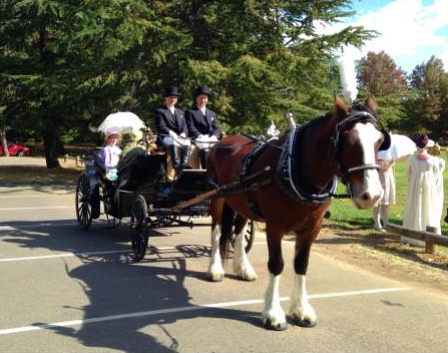 I’ve chosen this photo for the smell sense because there is nothing quite so grassily pungent as horse dung! We only had to contend with this lovely fellow’s leavings, but in Regency London the roads were full of the stuff: tons of horse dung. It created quite a few jobs including the “street sweeper”: a child armed with a broom who, for a coin, would clear a path through the excrement so that a lady or gentleman could cross the road without ruining their shoes or clothes. The Dark Days Club is out NOW published by Walker Books. Grab a copy and let us know what you think! !